Yes, I finally bought a tamagoyaki-pan the other day. (Must be a stress-induced impulsive buy. :P) Here's my not-so-successful dashimaki tamago. There you go. This is my tamagoyaki-pan (copper). And I'm practicing rolling the eggs with chopsticks, not a turner. It is a common practice for beginner Japanese chefs. Of course I don't mean to be a chef in the future or anything, but just wanted to be able to do that because that looks cool. 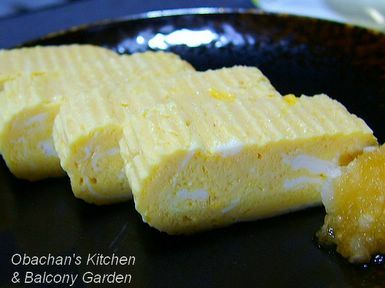 obachan, I love tamagoyaki too, but I find it hard to get the right amount of sugar, tashi and egg combination. I'm still trying to get the perfect amount, haven't been able to match the real taste with the one that's in my mind. do real tamagoyaki pans have those ridges? can i see apicture of the pan?! Did you remember to strain the eggs before cooking? I like my tamagoyaki both savory and sweet. Do you add soy sauce to your tamago, obachan, or are you just seasoning with sugar, salt and dashi? The recipe I use calls for soy sauce, but I don't like the mustiness it brings to the egg, so I think I'm going to omit it. I also dislike the brown tint it brings to the tamago. It looks good enough to me. I wish I can roll the egg perfectly like you did. I usually put a ladleful of dashi, a tsp of shoyu, a tsp of mirin and a tsp of sugar. I also use a spatula and chopsticks to roll the egg nicely. OK. I uploaded the photo. What do you think? It looks like a square pan in the photo, but it’s a rectangular one. Yeah, I like both savory and sweet versions. Good luck with your search. Hey, wait a sec., where do you live? You mean you can only find square pans over there? Yep, I add soy sauce. First I tried dark soy, then thought it was not salty enough while making tamago look browner, so changed to light soy sauce. I also use mirin. Oh, that’s sweet of you. (This is not really perfect, though.) Actually the shape is not the problem as far as you use makisu to shape the dashimaki tamago into a nice rectangular shape. And you use 3 eggs for that? Hi! I am from Singapore, and I can't find either rectangular or square pans here....yet. But I will keep searching. WOW - that looks really good Obachan! I have been practising making them too - using chopsticks to turn them. Getting a little better, but even yesterday I had a disaster. Ended up making scrambled eggs after the second turn! I made a video about this dish, but in it my obachan (!) doesn't really roll it, but folds it in half only once. I think that is to make a bigger one for the customers. I have been doing it as yours - but the ratio of dashi to eggs is really difficult to get right! Yeah, I saw your dashimaki post, but couldn't see the video. Too bad! BTW, when turning dashimaki with chopsticks, the key is the angle of the chopsticks.